That is the idea though. Right now it is only able to maintain base clocks not boost clocks. 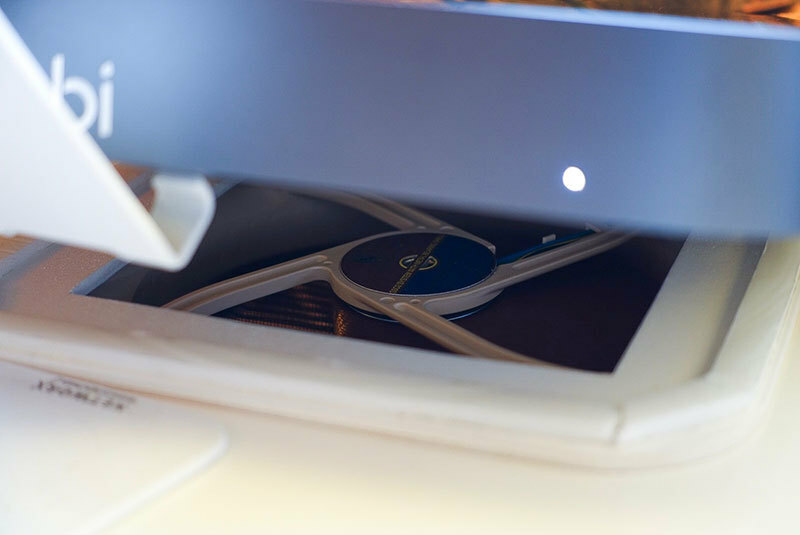 The goal isn't neccesarily to keep the CPU staying cool, but to be able to maintain higher clocks in heavy load situations for better performance. between idleing or normal useing before bench. I built my own semi-custom enclosure for the 2018 Mac Mini. I have two small fans with a manual speed controller and I turn it on when the I hit higher CPU use. 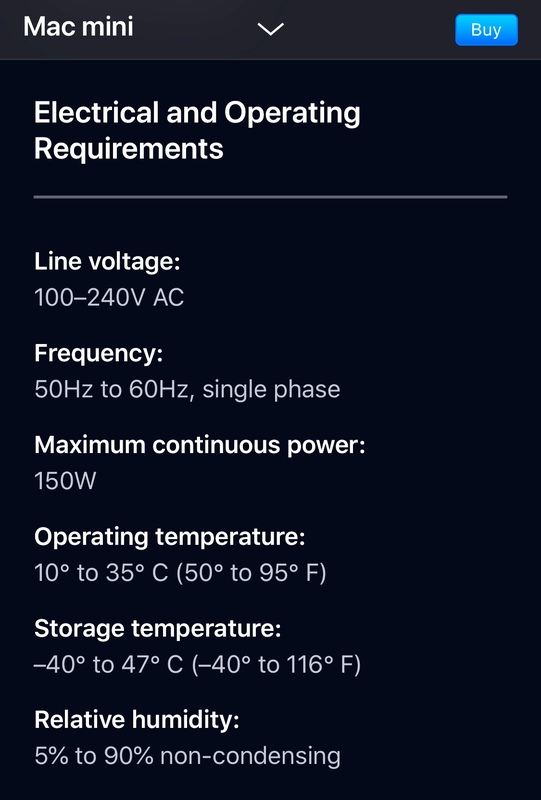 Together with Apple's air cooling it runs at low temps, so I am pleased with this setup. Next step is the eGPU... so many choices so little time. Are you able to show a picture of the intel power gadget with some benchmarks. Would like to see the same tests with and without your custom setup running. So you saying it reduces speed by 4.6% when its at max temp? Im going to liquid metal mine as soon as my ram comes in the mail. Hey all, I'm a new member here. We've just bought a 2018 mac mini with a 3.2GHz 6-core i7, 32GB ram, 1TB SSD and Sonnet 650w egpu with a Vega 64. We're curious if we can meaningfully get any more performance from this mac mini before the new mac pro is released next year sometime. The computer is solely used for video editing work in Adobe and FCX. Is there anything to be gained by reapplying thermal past or perhaps using Innovation Cooling's Graphite Thermal Paste? Seems like thermal paste change helps a lot on the Mac mini. God I hate youtubers... so overly dramatic and such forced opinions, all done to drive engagement in the chase for the advertisers dollar. Maybe I should start a channel, “honest reviews from a non screechy anti drama perspective “. I doubt anyone would watch. I agree with you about the YouTubers, @Eightarmedpet "It throttled 200MHz down! Oh no there goes all my productivity!" That being said, I do a little YT work as well. I made a video with my thoughts on it but to spare you I'll give the short version: the new Mac mini isn't meant for the "budget" crowd; it's really no longer the introductory Mac. Something that people like snazzylabs fail to grasp is that the Mac mini just wasn't selling well in the customer space but was doing very well in the enterprise, so Apple re-positioned it for that purpose. As someone who works in an enterprise environment I can tell you that we have no problem dropping $1500 per workstation & ordering 50 or 60 workstations at a time. No major enterprise will have an issue with an $800 workstation. 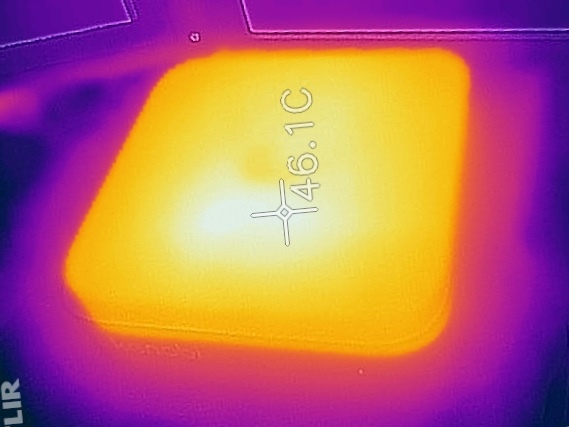 Sorry for the detour, back on topic: I know it's been discussed at length in other places but my 2012 Mac mini didn't have great thermal solution either. I used Noctua's NT-H1 thermal grease & dropped temperatures down from ~77C to ~65C. Bumping the CPU fan with TG Pro (which someone else mentioned here) up to 2200 RPM bring the temps down to 49C. If others are willing to try different thermal grease options we might could build a running thread of what temperature changes are. @jim_survak Would love to see your video... sounds like our thoughts align. I start discussing the Mac mini @ 39:50. It's about 20 minutes because I love the Mac mini & have a lot to say. And I think it needed explanation as to what the Mac mini was & now what it is. I went ahead and added Thermal Grizzly liquid metal to my i7. I ran both CinebenchR15 and Blender (BMW) and screen recorded before and after. I used Intel Power Gadget to monitor temps and clock speed. Peak temps were a few degrees cooler but nothing to OMG about, however, it did allow it to turbo boost a couple hundred MHz higher for longer resulting in a higher cinebench score and faster blender render times. I also saw a 200 point increase in Geekbench 3 breaking 5000/27000. All runs were with Mac fan control set to auto 50c fan ramp up. Thank you! Was this a difficult project? What are the average temperatures Now? 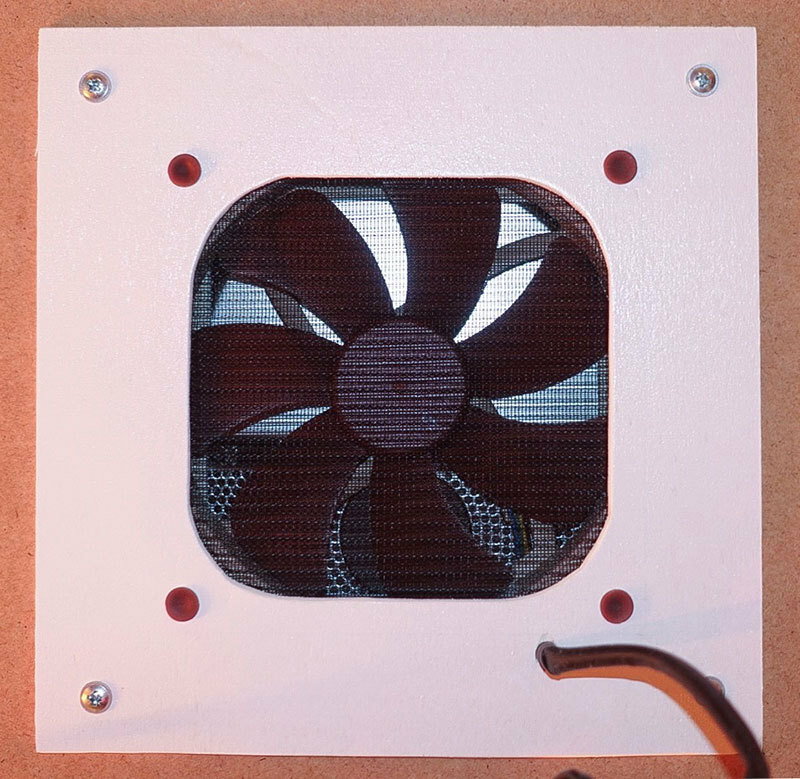 allows it to run up to 100c. Thank you, I will give it a go. I have some Prolimatech PK3. It is probably not as strong as the liquid metal but must be better than the stock compound. 3. High temperature in heavy load. 1.For the first problem I found two reasons: My sleep mode was not working correctly. Because of the missing pulsing LED I was not realizing that the Mac was still running even though external Disks did not spin, Monitors went off etc. But the Mac was still consuming almost 20 Watts, but without a spinning fan. That result in a case top temperature of more than 46°C. More than on heavy load where the fan is blowing most of the heat away. - The USB-C hub did not let the Mac sleep. - Same for Power Nap. Only if I removed the hub AND disabled Power Nap the temps got normal. 2. While normal work (no CPU heavy apps like Browsing, Twitch stream etc.) the Mac mini got really warm. Up to 70° for the CPU. Components like WiFi or SSD were quite hot too. 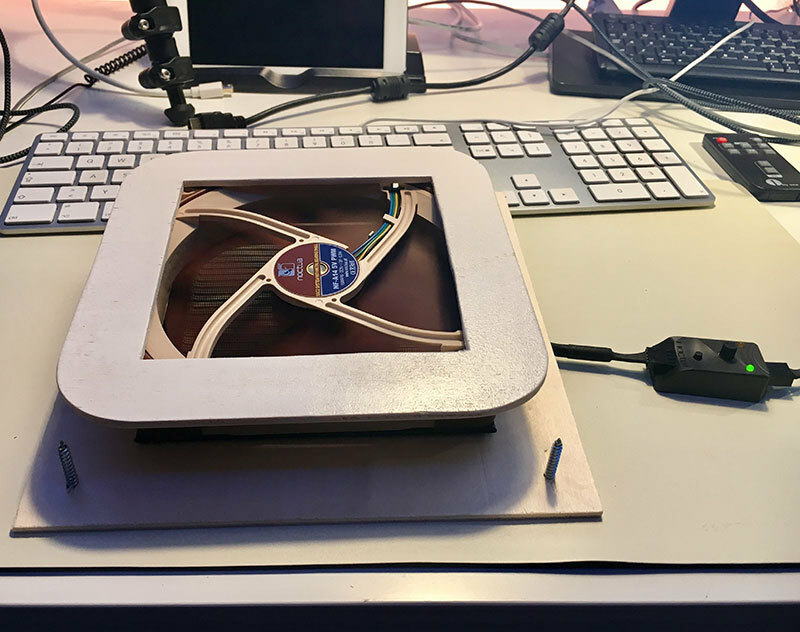 As a solution I built the Glory Blow Hole: A hole inside the table with a 14cm 5V USB fan, controlled by PWM. If you read Glory Blow Hole, please do it with Morgan Freemans voice in your mind... but with German accent! On a wooden panel with a hole I've placed a 14cm dust filter, then a Noctua 5V PWM fan, controlled by a Noctua PWM controller. All USB powered. The PWM controller will be replaced by a smarter solution wich will be controlled by my home automation later. At presence it goes on/off automatically when the Mac is in use. In future the speed will get adjusted dependent on the temperature of the CPU. Above the fan another panel which will later be glued on the table. 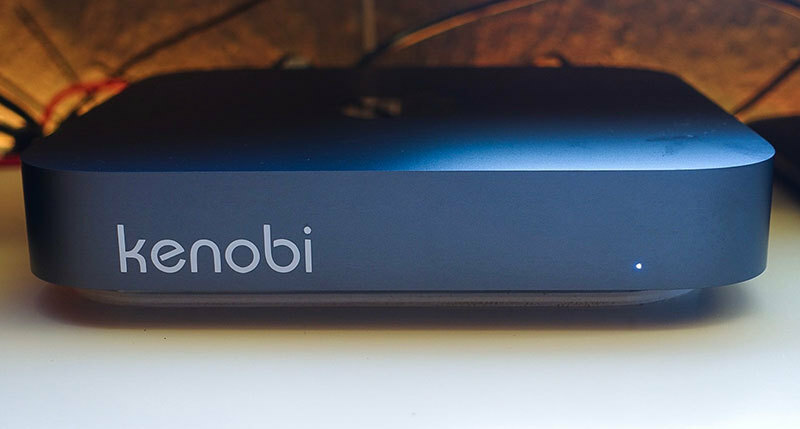 ... except if you lift Kenobi, my Mac Mini. I have added door isolation foam where the Mac is floating on. View from below. You can see the Mac mini without its plastic cap. On long workloads the improvement is much less: At a ~50 minutes test render in Cinema 4D it saved about 2 minutes. But hey, it's something! Components like WiFi or SSD are way cooler than before. I have no Geekbench results from before my Glory Blow Hole was implemented, but I did not expect higher than normal results - because Geekbench does not produce much heat. So my second fan is not really helping here. 3. I wanted to improve the heavy load temperatures further (beside my Glory Blow Hole that seemed already to help here) by replacing the Thermal compound. So I cleaned the CPU and heatsink and put Artic MX-2 on it. But honestly that was a waste of time: It did not improve the temperatures or the clock speed at all. Maybe I'll have to wait a little...sometimes it needs time till thermal paste works optimal. Total work for the Glory Blow Hole took about 3 hours including the time to find the right fan (silent, USB, PWM) and its controller. New software: macOS 10.14.2 (18C54), Windows 10 to be tried ! we have about the same configuration except for the 1TB SSD, i went with 512GB. How is it working for you with the VEGA 64 in Mac? I have upgraded my MacMini to 32GB and reapplied new thermal paste to AS5. Under full load (Prime 95) it is now about 10 degrees cooler as before. So your fan noise increased after adding AS5? 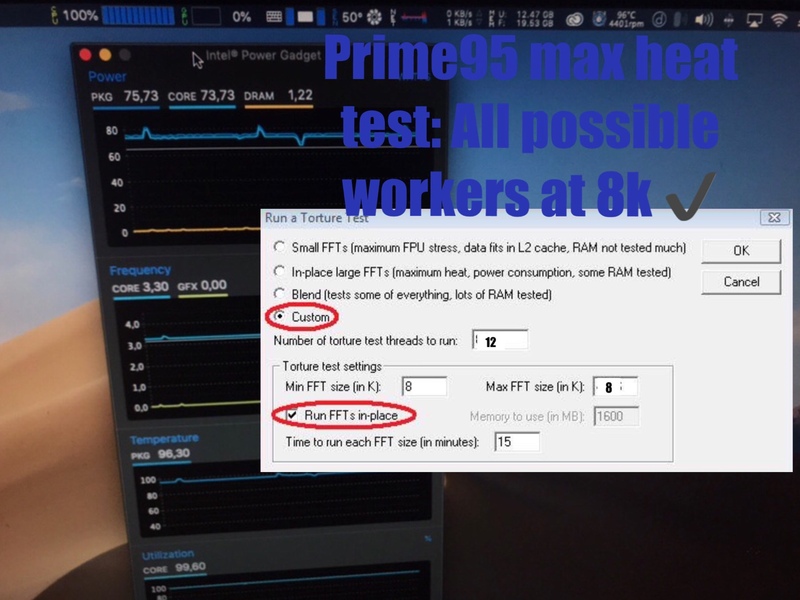 at Prime with 8k and 12 Workers? Small FFT, Large FFT or Blend? @waterchill Excellent. Thank you for the photos. I wonder if liquid metal would eat through the heat sink? Part is copper, part is aluminum? You’re only putting the liquid metal on the copper part so it should be ok. Thanks, I guess you have to hope that it does not run? Lower noise is fine, or get more turboboost at the same temperature. 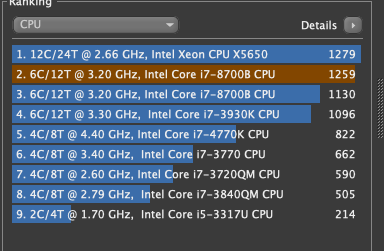 With stock paste my i7 runs the "8k test" with 3.3Ghz at full load. but i guess 10 minutes are enough to see where the turbo goes. but the ramswap was okay.